(SPOT.ph) The summer months are rolling in and we all know what comes alongside them: wind, clear skies and, of course, the sun! But as much as smelling salt in the air and having sandy toes seems to be on every outdoor-loving girl’s mind, lazing around the beach is not the only fun thing to do. Here are five things to add to your summer checklist to make this time a summer to remember. Enjoy the summertime sunshine while learning more of our country’s rich history! Explore the historic streets and buildings inside some of the country's heritage centers. Take your time and enjoy what it was like to walk on centuries-old paths—don’t forget your camera because almost every corner at these places is IG-worthy. If you’re looking forward to doing some cardio while bathing in the summer light of history, rent a bike to tour the area. And if you’re feeling like channeling your inner Maria Clara, you can hail down a kalesa! Scream loud and get your fill of adventure and adrenaline by challenging roads less travelled on 4WDs or ATVs! Be amazed at how diverse the country’s terrains through rice fields to lahar-covered plains to forest paths to lava and river trails. The recently concluded Philippine Hot Air Balloon Fiesta is one great example of such an exhibition. It's quite magical seeing all the balloons in the air! And aside from the the ballons themselves, other attractions entertained guests, such as car drifting, search-and-rescue demonstrations, and acrobatic skydiving shows. Make your weekends more exciting and explore all the pop-up markets that mushroom all over the city. Shop for organic produce, enjoy live music, check out handmade crafts, and sink your teeth into gastronomic delights. Grab a picnic basket, a blanket, some sandwiches and drinks, and head to the nearest park. Enjoy spots like the quiet of Plaza de Armas, Ayala Triangle Gardens, or RAVE’s butterfly gardens and aviary ins Pasig. Up north, there’s La Mesa EcoPark and the Quezon Memorial Circle. If the winds are favorable, wake the child in you and fly a kite! In fact, a kite flying activity was offered by SkinWhite to partons of the 2017 Philippine Hot Air Balloon Fiesta. SkinWhite Classic Lotion was enjoyed by fiesta goers to keep their skin bright and moisturized without that sticky and icky lotion feel. 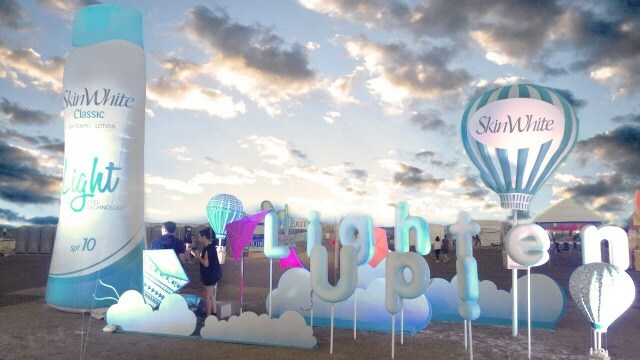 SkinWhite Classic Light, with its unique Light-Feel technology, feels feather light on your skin without the sticky feel—perfect for girls who love the outdoors, just like the many girls who enjoyed the sight of clear Clark sky as colorful kites and hot air balloons flew. Free from the heavy after-lotion feel, it's just what you need to keep your skin bright and moisturized this summer. So, grab a bottle of SkinWhite Classic Light, feel as light as a kite and make this summer an even bigger adventure. For more information on SkinWhite, click here.